Brian Carter, Professor and Dean of Architecture at the University of Buffalo, The State University of New York and a registered architect in the UK, recently visited RMIT and was an invited participant at the Inveresk Design Forum in Australia. 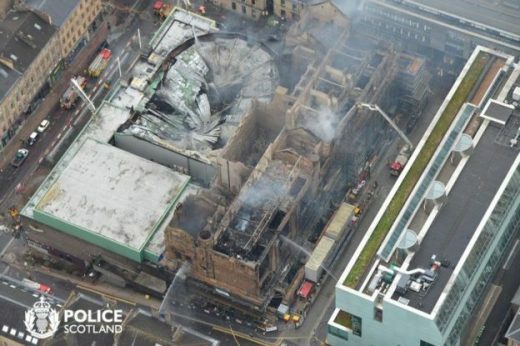 Advocates for REPLACE and RESTORE lined up quickly after the recent fire at Mackintosh’s School of Art in Glasgow. Yet the suggestions only provoke questions and highlight the need to consider different approaches. It is predictable that the Tile of Spain Awards would flush out buildings, most likely in Spain and covered with tiles. However it is encouraging to discover this real material, made from the earth and showing traces of the hand, used to reclaim buildings for education in Cadiz and Granada and lining civic space in Almazan. The awards from the 2012 World Architecture Festival define a new world with startling clarity. Here the old worlds of Europe and North America which were so fundamental to the creation of modern architecture are hazy. They are represented by just a handful of projects while Asia and the Far East predominate as the focus of alternative design thinking. 2012 – another year of architectural exhibitions? In a year characterized by extraordinary chaos and sweeping devastation across landscapes, economies and families alike perhaps it seems surprising to suggest that 2011 was the year of architectural exhibitions. Unlike painting, sculpture, music or theatre where the sound, colour, shape and feel of the creative act are placed directly in front of an audience – exhibitions of architecture, even at the best of times, seem to rarely present architecture. Instead they more often than not offer just a whiff of the action through different assemblies of models, sketches, drawings and photographs that frequently remove all evidence of use, time, struggle, gravity, money, wind or weather. That struggle is perhaps most obvious if you were to compare the announcement of the latest award to AAMI Park in Melbourne with that same place seen a couple of weeks ago amidst a flood of blue, black and white as the Geelong Cats chased away the Collingwood Magpies in the 2011 Australian Rules Football League Toyota Grand Final. For while this recent monument by the Yarra recalls the enthusiasm for structure embodied in much of the work of Cox Architecture the introduction of a surprising bubbly canopy also makes it a strikingly different project. Performance is increasingly a focus of architecture. Prompted by genuine curiosity and an increasing urgency to know how the design of buildings can help to improve environmental conditions it is an interest that is also being fuelled by new technologies that enable spaces and systems to be monitored more effectively. May 20, 2018 in Editors.